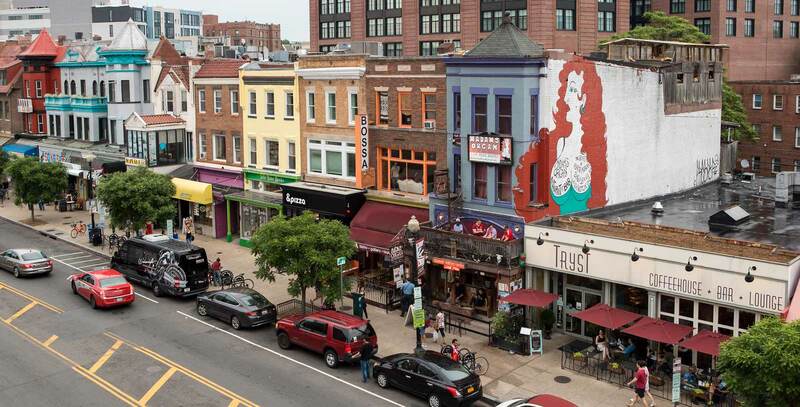 Vibrant, eclectic, unique — Adams Morgan is world-renowned for its fantastic restaurants and nightlife, colorful storefronts and historic, tree-lined residential streets. More than 240 restaurants and businesses call this artistic neighborhood home, from friendly sidewalk cafes to Michelin-starred restaurants with diverse cuisine, intimate local shops and some of Washington’s liveliest nightspots. Young professionals come for the spicy urban experience…and stay to raise their families. The primary crossroads of Adams Morgan — Columbia Road and 18th Street, NW — forms the epicenter for independently owned shops that sell unique, one-of-a-kind items in all price ranges. Visitors will find unique records and books, home furnishings, new and vintage clothing, and local artists’ work. The renowned Michelin Guide features seven restaurants in Adams Morgan (Roofers Union, The Diner, Sakuramen, Mintwood Place, Jack Rose Dining Saloon), with Tail Up Goat receiving a star & Lapis included in the Bib Gourmand list. Featuring ethnic and food from around the world and renowned chefs such as Erik Bruner-Yang and Spike Gjerde, restaurants range from India, Korea, Ethiopia, Afghanistan to Japan, and elsewhere.